In November NTR’s CEO Nick Mikhailovsky presented our company at two major events. 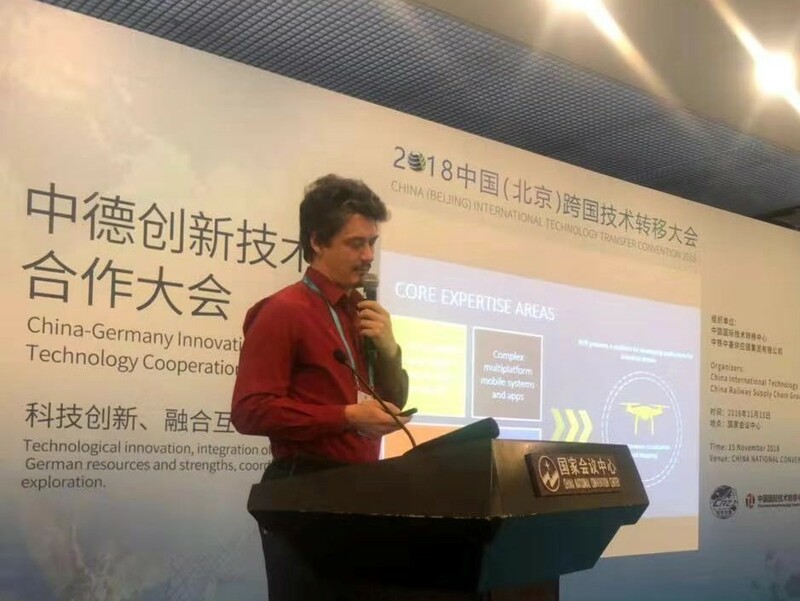 Mid November found NTR CEO Nick Mikhailovsky at the China International Technology Transfer Convention (ITTC) in Beijing, hosted by the Ministry of Science and Technology of the PRC. I recently attended the CITTC in Beijing. I was there to present our indoor drone navigation system. There were many government representatives and the deputy mayor of Beijing led the session. It felt very different from similar conferences in Russia and in the States. First, there is always a competitiveness and “pursuer syndrome” in everything – “we caught up with and overtook Germany in this parameter and little before the USA level remained”. I think this is a giant motivator for the Chinese. Yes, competition is always strong. In Russia when you do a startup you may have a competitor or two, whereas there will be 10 of them in the States, but there could be 100 competitors in China. Competition itself is very effective and, when it is reinforced by a sense of coming success, it is really on fire. Secondly, there is the same feeling that happens in any fast growing market when you plant a seed and it comes up. This feeling was prevalent in the 90s in Russia and often appears in the Valley. At the same time, the behavior of Chinese state agencies seems to be quite different from Russia’s. It seems that they are not trying to minimize risks, but to give, as they say, a platform for development and seem more accepting of the risks. It is clear that this is based on the national culture of a very enterprising and hardworking people. AmCham, the American Chamber of Commerce, is the leading foreign business organization in Russia, effectively advocating the trade and investment interests of over 500 member companies. It held its first industrial supplier pitch session in Moscow at the end of November and I was a presenting vendor. The AmCham Shark Tank style pitchfest gave five Russian entrepreneurs the opportunity to pitch their high tech production-oriented solutions to a panel of seven experts. The audience was composed of large member companies looking for innovative, industrial solutions. I presented NTR’s Autonomous Drone Navigation Platform that’s based on computer vision technology. NTR’s navigation system can function in a closed, GPS denied, totally dark environment, such as oil tanks, tunnels or subways for technical or security inspections. It was great exposure for us and I felt we were in very good company! Here are the other companies that presented. Conundrum | AI-based product that helps factories solve tasks of predictive maintenance and optimization. Conundrum AIaaS provides cross-domain experience-sharing technology for the improvement of AI. Suitable for chemical factories, oil/gas refineries, steel production, power stations. Robosklad | The company’s portfolio includes 20 products and technological innovative solutions in warehouse and fulfillment automation, robotics and digital fabrication. Teplorium | Translucent structures with nontransparent walls energy efficiency. Heat and cool saving. Supreme acoustic insulation and daylighting without energy losses. Thercon | Provides loop heat pipe – the basic element in the construction of a highly effective thermal control system, facilitating the implementation of both an air and a liquid cooling system of a greenhouse data centers, power electronics space technologies, energy saving technologies. Want to know how a drone can navigate sans humans, light and GPS? Contact Nick directly at nickm@ntrlab.com.